The lávvu served for centuries as portable housing for reindeer herders. Its practical, efficient design and cultural heritage are attracting new users across Scandinavia. 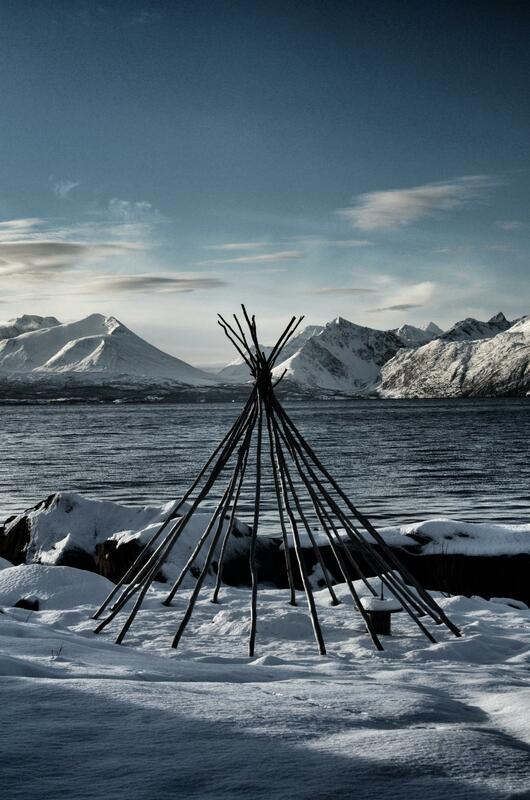 Travellers who drive along the E6 through northern Norway soon encounter the lávvu. 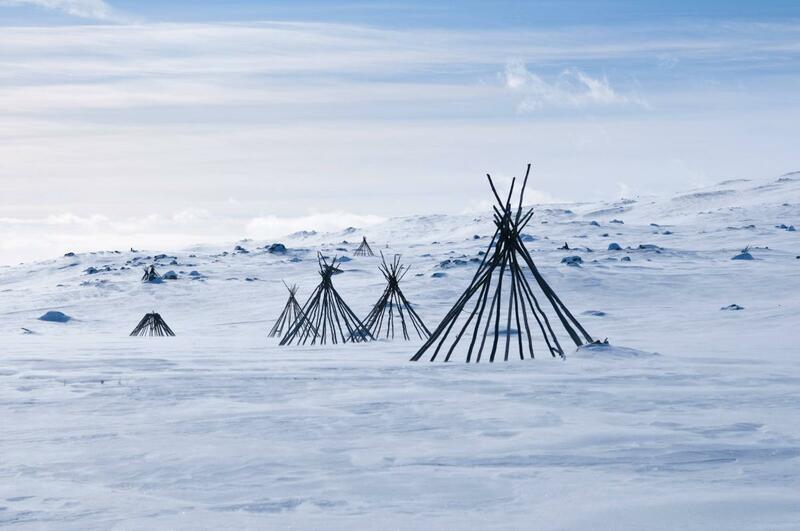 This traditional Sámi dwelling somewhat resembles the tipis of the North American Indians, but is built lower to the ground to withstand the fierce winds and sub-zero temperatures of the far north. Nevertheless, unlike its larger cousin, the goahti, it is a temporary structure, designed to be easily disassembled, transported and reassembled as the reindeer herds migrate across the tundra. 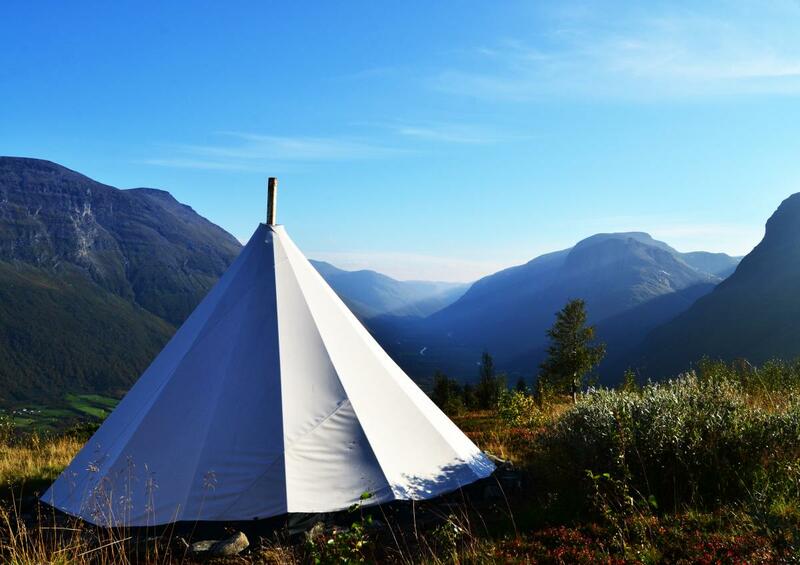 Perfectly adapted to the needs of the semi-nomadic reindeer herders of the Arctic, this remarkably resilient design is enjoying a broader popularity throughout Scandinavia today. Construction of the lávvu begins with three long poles whose top ends are notched or forked so that they interlock with each other. These poles form a sturdy tripod against which additional poles are laid to fill out the structure’s form. The walls, traditionally sewn together from reindeer hides, are today made of light, sturdy fabrics draped over the frame in such a way as to leave a smoke hole at the top and air vents at the bottom, since a fire burns in the centre of the lávvu to heat the interior and keep mosquitoes away. Freestanding and stable without requiring the use of stakes, guy ropes or a central pole, this simple, yet ingenious structure is extremely practical, energy-efficient and, at least in its original form, built wholly from locally available materials. This traditional dwelling of the Sámi people gained national fame in 1979 when a group of Sámi set up a lávvu outside the Norwegian parliament building in Oslo and went on a hunger strike to protest against the government’s plan to dam the Alta River in Finnmark. 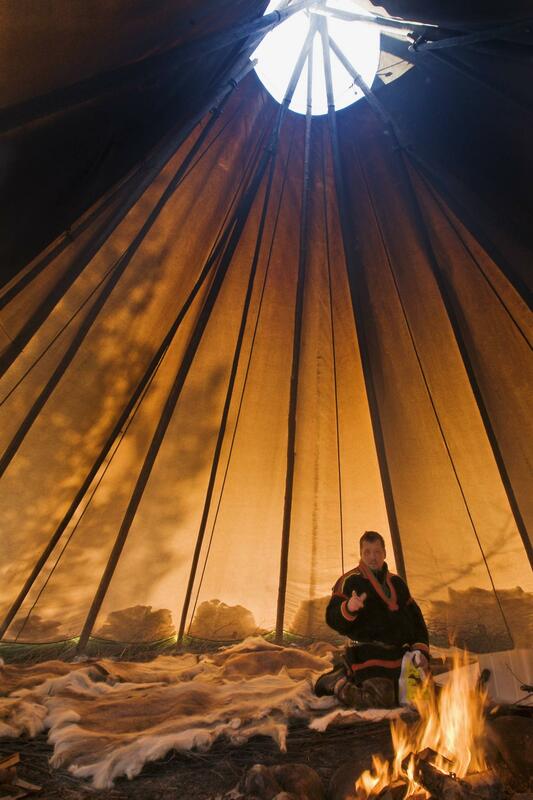 Since that day the lávvu has been more than just a ‘Sámi tent’; it is also a powerful symbol of Sámi culture and rights. Although this design has a documented history that reaches back at least 2,000 years, it still captures people’s hearts and minds, inspiring artists and anthropologists alike. In 2012 it was awarded the Architectural Prize of the North Norwegian Architects Association, selected for its functionality, but also for its spiritual and cultural significance. The award was accepted on behalf of the lávvu by councillor Marianne Balto of the Norwegian Sámi parliament, who noted that ‘the shapes and ways the lávvu was built represent important values for Sámi culture. The logical basic construction and the use of local materials reflect a culture that values practical knowledge and skills. The choice of materials, not always considered beautiful by aesthetic standards, shows the ability and will to adapt to the necessity for survival, something that is of the utmost importance in a culture based on self-reliance’. 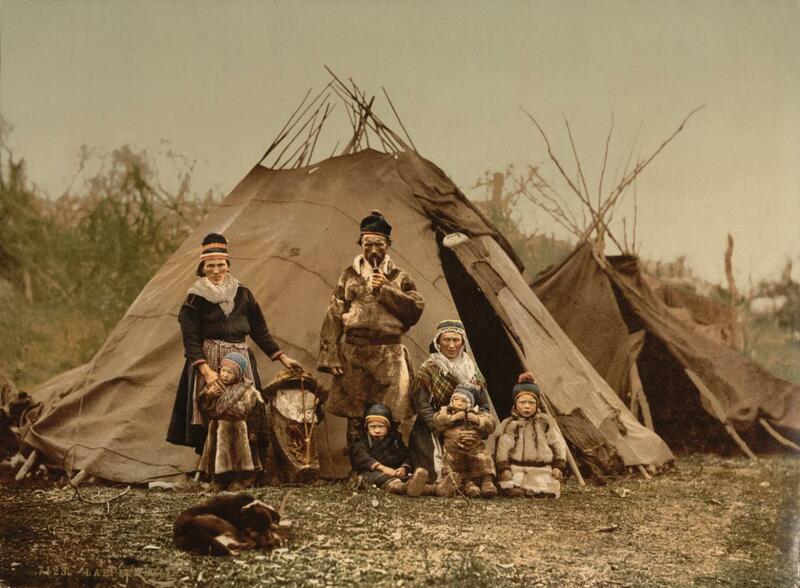 The traditional lávvu was well suited to the Sámi’s semi-nomadic life. The tundra provided the trees, branches and stones for its frame, and the reindeer herd provided the skins for its walls. Its simple construction and light weight made it easy to dismantle when moving with the herd and quick to reassemble again at the new campsite. New technologies and new materials, far from turning lávvus into relics from the past, have augmented their virtues and their appeal to a wide variety of new users. Fishermen and hunters alike in northern Scandinavia have adopted them. Lávvus can be spotted next to nearly every popular lake in high season, and a great number are also placed in strategic locations along hiking routes as shelters. They are popular at outdoor festivals of all kinds, and it isn’t unusual to see one behind a family home, serving as an extra bedroom in summer. Kindergartens and schools in the Arctic often have lávvus where stories are told and students are taught about Sámi culture. There are also several small villages scattered along the northern coast that have bought or made lávvus to be used as public meeting places. This renaissance has led to a growing market, and the number of specialised manufacturers in Scandinavia is increasing. But even as the fabrics and materials change, the basic design remains the same. The architectural masterpiece of the ancient Sámi of the north is still thriving, still finding new applications that its creators never dreamed of. Per Kristian Bergmo is a freelance photographer with a degree in archaeology. He once moved to Barcelona, only to return to his native Arctic Norway, where he feels most at home.